Oct. 22, 2017, 8:54 a.m.
Quite often there are questions in one way or another related to the work of the graphic scene, with custom figures, drawing lines on the graphic scene, and even all sorts of broken lines. And then I remembered about one project that I did as a test task. On the implementation of this project in its time (1.5 years ago), I spent about 36 hours of working time ... now it would take less time. And now we will deal with the key points in the project. Let's start with the structure. As you can see, this is the largest structure of the project from all the articles presented on the site. In addition to these files, there are also GUI files, and icons for buttons. The main application window serves for loading and saving SVG files, displaying a graphic scene on which graphics objects work, as well as buttons that control the creation and editing of graphic objects. Here are a few interface buttons. The polyline tool allows you to create one line with the color and width options, and then using the cursor tool, you can create new points on the line by double clicking and move them, allowing you to make a broken line. The rectangle tool allows you to create a rectangle by specifying a fill or gradient, as well as the width and color of the outline. Using the cursor tool, you can edit the parameters of the rectangle, as well as change its size and rotation angle. The SVG format is an XML format that can have many different implementations, so this editor is primitive and can not load all possible formats, and works guaranteed only with those files that it can create. But even here there may be errors depending on which version of Qt the project was compiled with. To restore graphical objects, use the auxiliary class SvgReader. It also uses the transformation matrix. The whole point of working with graphic objects in this case is that you need to override the mouse event processing methods to react to mouse movement over an object, to clicks, etc. 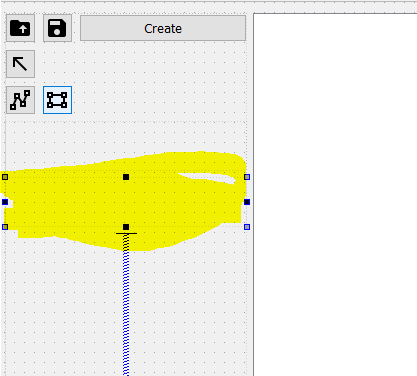 To correctly arrange line points on a graphic scene, you need to use an auxiliary variable, relative to which the position of the previous click on the graphic scene - m_leftMouseButtonPressed will be stored. Concerning this variable, the delta position is calculated to calculate the correct position of the new point, or the new position of the old point of the broken line. To determine the location of creating a new point on the line, you use the mouseDoubleClickEvent method overrides. The essence of the method is that it is necessary to determine the position of the point in the path of the QPainterPath line, split the line into two lines into which the given point enters and set a new path to this graphic object. Also interesting is the fact that moving points on the graphic scene is carried out using special graphic objects, signal points of the DotSignal class, which are ordinary rectangles that report the coordinates of points and the new positions of the points coordinates, with the change of which the QPainterPath automatically changes. Signal points are used to indicate the movement of the parent of the signal point. That is, each signal point is attached to a certain parent and is responsible for the movement of some part of it. As you can see from the following code, all method overrides serve only to calculate the delta of coordinates and the design of the point itself, for example, if the mouse cursor is above the point, the point will be red if the point area leaves the point, the point will be black. To manage the signal points that are responsible for the rescheduling and rotation, enumerations are also used. If you change the position of one of the signal points, you must change the position of all the other points by using the setPositionGrabbers() method; among other things, depending on the editing mode, you will use the method of setting the visibility of signal points. setVisibilityGrabbers() . To normalize the angle of rotation with the rotation change, the normalization function will be used so that the rotation angle in radians does not exceed 2Pi. Working with a graphic scene combines the work of all instruments depending on the current type of instrument. As you can see, two types of tools are used here. Two of them are a broken line and a rectangle. One tool is used to create a selection of all objects. And the first one is used for the normal cursor tool, which allows you to select objects and edit them. An important moment when working with a graphic scene is that all graphic objects in this case simply cast to the desired type, depending on which tool we are working with at the moment. In general, to be honest, after a year and a half I would have written differently. The fact is that the QGraphicsItem object has a virtual type() method when you override which you can return the type of the object. And this, in turn, opens up the possibility of using a single method for performing various functions. For example, to move an object or change its color, and for a variety of objects. Therefore, when you take for osonovu this project to develop your editor, then try to take this moment into account. Assigning a specified type in the form of enumeration to graphic objects can greatly simplify the development. For example, if you take a move method with a clipped button for all these graphic objects, you could create one setEndPoint() method altogether and controlling the installation of the endpoint will greatly simplify and reduce the number, for example, here in this method. Going back to this code, I probably copied a lot of things here, and I would also take up my own programming business - "Code Removing" Seriously, my favorite tool in programming is the Occam razor. But as I said before, I spent 36 hours working on developing this project with my skills a year and a half ago, and I still can not afford to spend 8-10 hours to rework the project, but we can always discuss with you the points at issue forum site. This project also shows how much code you need to write and how much time to spend to realize even a small functionality. And personally, I'm currently working on a project in which about several thousand source files, and the build folder swells at the end of the project assembly to 12 GB, I think this project is microscopic. And nevertheless, even for the implementation of such a functional, you can spend quite a lot of time. Therefore, one of the important skills of a software developer, I think the ability to soberly assess their capabilities and anticipated deadlines, and in the process of work, do not be distracted by side tasks or tasks that are not relevant to your current assignment. Oct. 22, 2017, 4:49 p.m.
Nov. 5, 2017, 6:01 p.m.
Sir could you please explain me,how can I design oval shape same as this rectangle design.what should I need to do ? Try inherit your Oval Graphics Item from QGraphicsEllipseItem and QObject, and implement logic, which similar to logic for Rectangle. Nov. 14, 2017, 9:33 p.m.
Sir,In this form design how did you add verectanglesettings.ui,vepolylinesettings.ui UI's to this mainwindow.ui ? have any QT tool to add so. this image shows what I meaning. Nov. 15, 2017, 7:56 a.m.
Nov. 15, 2017, 8:27 a.m.
Nov. 22, 2017, 10:25 a.m.
As far as I can see your classes inherit from both QObject and QGraphics*. QGraphics* are already QObjects and multiple inheritance from QObjects lead to some problems with moc. Nov. 22, 2017, 10:30 a.m. If you see sources of class QGraphicsObject or if you see documentation of QGraphicsObject, then you will understand, that it is not problem in this case, because of QGraphicsRectItem inherits from QGraphicsItem , which has not inheritance from QObject. You have invalid information about inheritance of these classes. Is this works only windows OS ? Dec. 5, 2017, 8:45 p.m. It should work on Windows, Mac OS and Linux. Because it not contains platform-dependent components.